Typhoon Ruby, with international name of Hagupit, had officially made landfall in Dolores, Eastern Samar at around 9:15 pm on December 6, 2014. Red rain fall warning had been designated to the Eastern Visayas. Low lying areas are still at high risk of flashfloods and the mountainous areas are under the risk of landslides according to PAGASA. Forty-nine areas are under storm warning signals including Metro Manila since Typhoon Ruby had made landfall. As reported in GMA News, between 10am, Typhoon Ruby is expected to make its second landfall in Masbate on Sunday, December 7. Heavy and intense rainfall is also expected along with a storm surge as high as 3 meters. 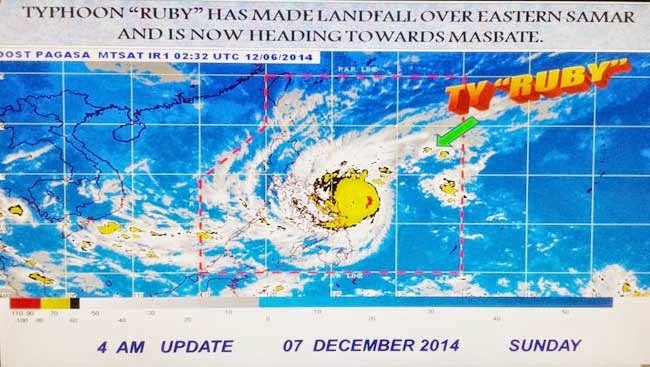 Then, Ruby will next hit Sibuyan Island at around 8pm to 10pm as it is expected to reach Romblon in the morning of December 8, Monday. It will then be exiting on Monday night through Oriental Mindoro and out of Philippine Area of Responsibility. According to PAGASA, Ruby had slightly weaken with now sustained winds of 160kph and gustiness of 195kph but it is still dangerous and strong as it is a typhoon category cyclone and can still cause heavy damages to the affected areas. the Bantayan and Camotes Islands.